Mushrooms are one of my favorite foods. You can slice them into a salad, chop them finely and add them to a meatloaf (try it! ), roast them, bake them in a bit of beef broth, or simply sauté them in a bit of oil and butter, which is probably the easiest way to turn three ingredients into a side dish. 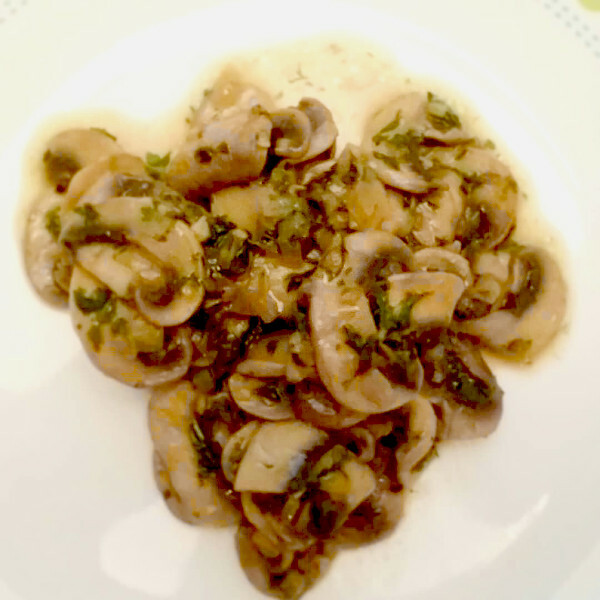 If you have the time, this recipe raises sautéd mushrooms to a higher level. But let’s talk about food photography for a bit. I am not good at it, largely because I use my phone (which is not an iPhone) for images like this in the heat of the moment. I need to plan better, and have a proper set up so that the minute the dish is ready, I can plate it and use an actual camera for taking pictures. Also, I need to quick taking so many (in other words, all) top-down pictures. Believe me, this dish is far better than it looks. Makes a small side for four people. Heat the oil in a heavy-bottom skillet over medium heat. Add the onions and sauté until they are softened and translucent. Try to avoid putting any color on them. Add the garlic and sauté for a minute more. Add the butter. When the butter is melted, add and mushrooms and cook, stirring constantly, until they start to give up their liquid. Continue cooking, stirring occasionally, until the liquid has evaporated. Continue to cook until the mushrooms begin to brown and you see a bit of fond on the bottom of the pan. Add the white wine and deglaze, scraping any browned bits off the bottom of the pan. When almost all of the wine has evaporated, add the parsley and the additional tablespoon of butter and stir until the butter is melter. Serve. Avoid using a non-stick pan for this. Use a heavy-bottom stainless steel pan. For a quick introduction to fond and deglazing, see this page on Food 52.